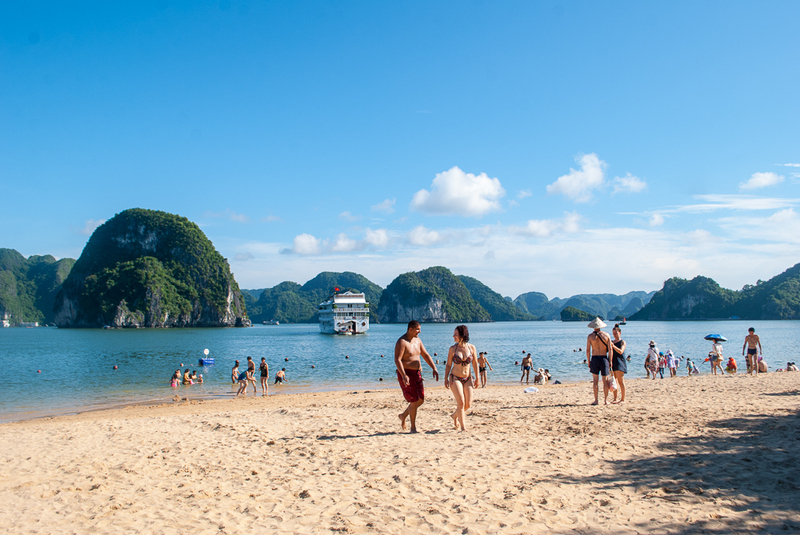 Home > Ti Top Island > A must-see beach on Halong Bay! To be known as one of seven natural wonders of the world, Halong Bayis a pride of Vietnamese. It is endowed by the magical beauty, Ti Top beach is the harmony between the clouds and water, it brings the unique masterpiece landscape which bewitch any soul of visitors. By Ti Top beach, visitors not only kick up the blue sea and white sand, but also experiencing with wonderful space where you feel you'r floating on a little moon of mountain’s Ti Top. Let Vietnam Typical Tours explore the beauty of Ti Top for you. Panoramic view of island, Ti Top was shaped the moon which had gently embraced whole Small Island in the immensity sky. The white sand’s Ti Top is not large but it was clear by the tide, so it bring a primitive beauty. It is surrounded by rocks and trees of green forest cover along the sea, one side is colored mountains, another side is colored depth of the ocean, Ti Top beach is harmonious of nature. Ti Top beach belongs to Ti Top Island in Halong Bay. It’s about 8km from Bai Chay cruise to the southeast. This island had the folk name which is “Cemetery” or “Pink Tower”. This name comes from 1905 when one of the cargo ship’s French was hit by under rock because of no navigator to format the way. All of sailors died and buried in this island. Henceforth, the island is named “ Nghia Dia” to tribute to the fated man. In 1962, Uncle Ho together with the astronauts named Gherman Ti Top visited the island. Because of this unknown island, Uncle consulted people to take the name of this astronaut to celebrate friendship between Vietnam and Russia. And of course, all of them praised the decision. The name “Ti Top” exist from this day. In the cool breeze when shining of the sun, the water is clear enough to see shoals of small fish swimming around more coastal sand bottom, each blooming coral bottom, each light wave ripples hit shelves white sand of the Ti Top as a affectionate sentiments of the ocean is devoted love for this beautiful beach. This beach is very beautiful and is well worth a visit to cool off when the heats starts to get to you. If you spend a day at the beach and elect to take a deckchair, you will be asked to buy either a baguette, some lovely pineapple or a drink, otherwise you will have to pay for the seat. During the full moon, you are able to wander around until late at night. Ti Top beach is clear and has blue water in four seasons, within open space, no noise; it’s the main attraction where tourists come here to enjoy the most comfortable vacation. 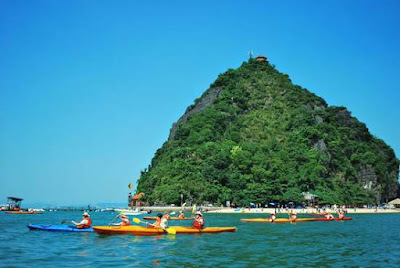 Tourist can unleash the beach and participate in beach sports games such as swimming, volleyball, skydiving, surfing beach motorcycle, or gently sailing around the islands of the bay. Those who love to explore, can’t to skip the journey climbing to the top of TiTop to fully enjoy stunning views of the bay from above. From the top of the mountain overlooking the Ti Top beach. Halong Bay area in particular and Northern Vietnam in general are affected by storm around mid-June to August. So, if you want to go to the Ti Top, the best idea is avoid this time, or you can see the weather forecast or combination with travel companies to have a fullest trip. 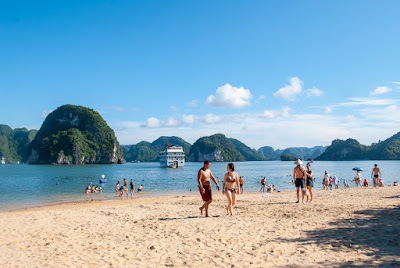 Most of tours in Halong bay these days, whether day tours or longer duration ones, usually include Ti Top island in their itineraries with a few hours free time so that tourists can enjoy swimming or playing around on the beach. 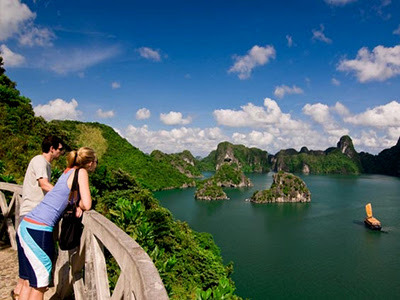 There are a lot of travel agencies that provide Halong bay tours from Hanoi for tourists with tour duration ranging from one day tour to two or even three-day tours. For those with flexible time on their trips, staying on a cruise overnight to enjoy sunset on the sea at Halong bay might be a beautiful experience. Those interested in Hanoi – Halong many-day tours can take a look at our Halong Cruises recommended itinerary.